Scientists at The University of Texas Institute for Geophysics (UTIG) have found that a devastating combination of global warming and El Niño is responsible for causing extreme temperatures in April 2016 in Southeast Asia. The research, published on June 6 in the journal Nature Communications, shows that El Niño triggered the heat, causing about half of the warming, while global warming caused one-third and raised the heat into record-breaking territories, according to the team's analysis. El Niño is a climate pattern that impacts the tropical Pacific, and usually brings warmer temperatures to Southeast Asia in April. 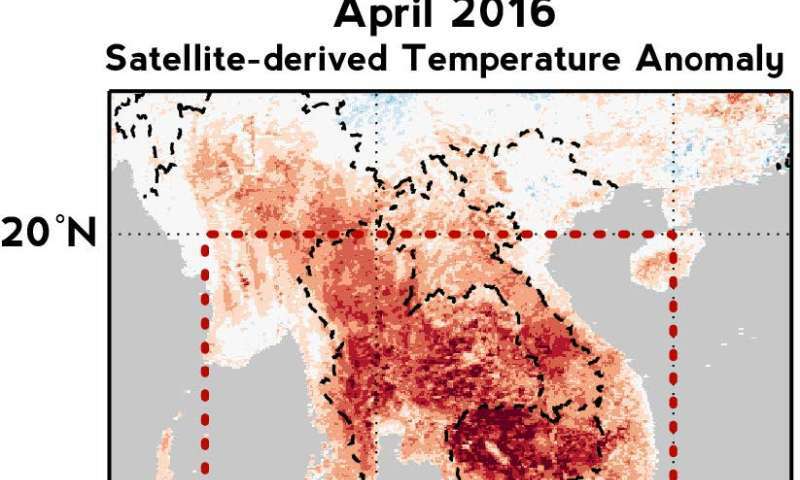 In April 2016, high temperatures in mainland Southeast Asia broke all previous records, exacerbating energy consumption, disrupting crop production and causing severe human discomfort in Cambodia, Thailand and other countries in the region. The especially high temperatures of 2016 made the researchers interested in investigating the factors behind such extreme heat, including the impact of the record-breaking El Niño of 2015 and whether ongoing global warming played a significant role in the event. The researchers used computer model simulations designed to disentangle the natural and human-made causes of the extreme heat. They also used observations from land and ocean monitoring systems and found that long-term warming has played an increasing role in rising April temperatures in Southeast Asia. 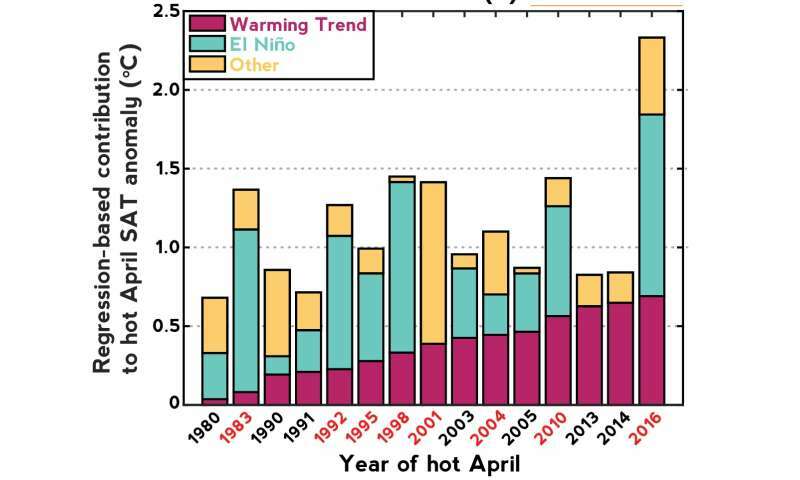 Since 1980, this trend has caused a new temperature record each April following an El Niño. "The El Niño system primes mainland Southeast Asia for extremes, although long-term warming is undoubtedly exacerbating these hot Aprils," said UTIG postdoctoral fellow Kaustubh Thirumalai, who led the study. UTIG is a research unit of the UT Austin Jackson School of Geosciences. The researchers used statistical techniques to quantify the contributions from El Niño and from long-term warming. Their analysis looked at the 15 hottest April temperatures over the past 80 years. All of them occurred after 1980, and all of them but one coincided with El Niño. They found that while the impact of El Niño fluctuated over the years, the impact of global warming has steadily increased over time. "Though almost 50 percent of the April 2016 event was due to the 2015-16 El Niño, at least 30 percent of the anomaly was due to long-term warming, and there's definitely more to come in the future," Thirumalai said. Looking at the model predictions for the next 50 years, the researchers found that the impact of climate change could amplify the effects of each El Niño, leading to temperature records being broken more often. "Because of long-term warming, even a weaker El Niño than the 2015-16 event in the mid-to-late 21st century could cause bigger impacts," said co-author Pedro DiNezio, who is a research associate at UTIG. Despite all the evidence pointing to worsening extremes, the researchers emphasized that preparedness could allow societies in this region to cope with climate change. "The silver lining is that these can be predicted a few months in advance since they happen after the peak of an El Niño," Thirumalai said. suggestive that the El Nino component is far greater than whatever manmade component might exist. Perhaps true - although very anecdotal. Do you think that this then discounts the data showing average global temps going up? As a 'noisy' fluctuation over the baseline rising, yes El Nino might be more dramatic on the short term. But that baseline component exists and is being applied year after year El Nino or not. So in the long term, that component is more important. Especially when El Ninos are likely to continue to exist as fluctuations above baseline heating, they will get more and more extreme, even if their fluctuation from the year previous isn't as great. The high temperature in Southeast Asia was almost an inkling to a dystopian future. In the day, you found yourself uncomfortably hot, so you open the window expecting a cool breeze but is greeted by warm air, that is like a hot blower. You think "wait a minute... my house was cold? I should go outside often, I need to fix my expectation". Now, as the day continue, the temperature in your house began to exceed of the outside. By twilight, if not for the sun disappearing below horizon, you'd think you'd get cooked. The night became the time to purge all the heat, you use exhaust fan to purge the air out of your house, you use fan to cool yourself and the wall of the house. The wall was a heat sponge, it is a blackbody irradiating infrared radiation that increase night after night, it make you sweat & sweater, you must purge the heat before the night end, you'd even feel the roof at day. Okay, in short, it's like in a sci-fi movie, the end is nigh. In southeast asia, a square foot of sunlight is like a massive amount of pain rays impinging into your flesh and stuff. It's soo much energy! Everyone, come to southeast asia to experience massive irradiation of energy into your psyche. It's too bright!